This is a newly developed swing away cap hats heat press transfer machine. This machine has nice outer appearance with fine workmanship. This Heat Press is compact which saves space. It will produce a delightful result in a few minutes and you will enjoy the memories every time you use it. Adjustable multi-spring balancer - Handle applies closing pressure through a spring and pressure-plate system, which allows pressure to be more evenly distributed across the entire platen when is closed. Spring-loaded cap tensioner - This adjustable tensioner makes single-user operation a breeze. Holds the cap flat against the lower platen and secures the cap from moving while aligning transfers. Swing-away design - Full 360-degree rotation of swing arm allows the heating element to be moved safely aside, reducing the chances of accidental contact. Commercial grade steel frame is super stable and built to last; Comfortable rubber grip for everyday-use and long production runs. The swing-away feature allows you to rotate the upper heat platen 360 degrees around, which can reduce the chance of accidentally contacting the area of heat distribution. Digital LCD temperature control enables you to set desired temperature and element will stop heating when preset temperature is reached. 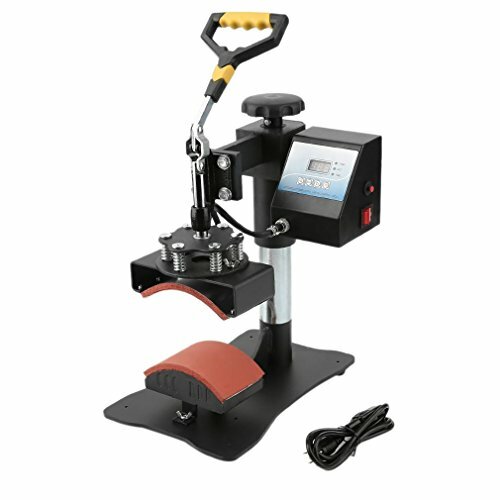 This hat press is intent for both commercial and home use, It can be able to apply transfers, letters, numbers and images on cap, baseball hats and any other items. If you have any questions about this product by CalmTime, contact us by completing and submitting the form below. If you are looking for a specif part number, please include it with your message.